I'm in love with my new lamp. I love lamps with black shades and this one just hit the spot. I wanted something elegant and timeless yet contemporary for this little corner. Lighting is so important in our daily lives. I feel like if I have good lighting I'm more efficient and more energized, plus if the light source is beautiful (ie like my new lamp!) then my happiness factor increases. Its hard to explain, but beautiful lamps are something I have grown up with so I cannot have it any other way. I arranged this little vignette to highlight my newest addition inspired by this post. What do we think? There are so many fabulous online websites for lighting but I was very pleased at the product selection at lamps.com. Do you have an online lamp source you recommend? Oh, can I please keep raving about my snake box? I know I blogged about it before, but for $14 I can't take how good it is. I love it, I love, I love it. It looks beautiful! love the lamp and you did an amazing job putting it all together! the lamp is beautiful and what a gorgeous vignette! lighting makes or breaks my productivity as well. Gorgeous!!!! 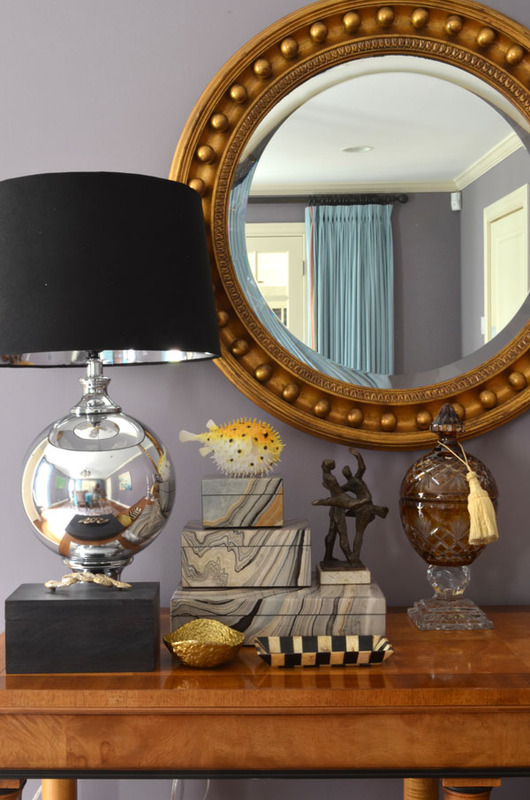 That lamp is beautiful and looks perfect with the mirror and accessories. 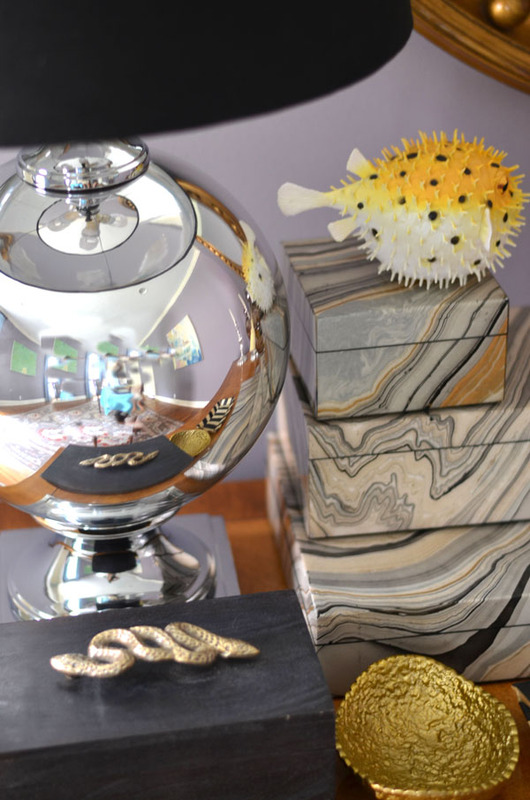 I really do love that lamp–such a statement piece! Beautiful vignette! I love every single bit of it! Oooo, love what you put together here, Albertina! That little brass dog is too too cute! Oh that lamp is killer lady, and the table is styled to perfection. I recognize that trinket box from Target? And I love those stacked pandora boxes. My go-to source for lamps(online)are: lamps Plus, Eurostyle Lighting and Joss and Main. That lamp is beautiful! I love those boxes too, just a beautiful set up Albertina! Stunning lamp! Ok could we please discuss those lovely boxes??? And that wall color!? Oh my! I just love this! The lamp and mirror are gorgeous together. FAB!!! Love the boxes too of course! I am totally loving this whole vignette but particularly those boxes! The lamp is gorgeous and the mirror too. I like the way the pattern and colours of the boxes brings everything together. I agree that lighting is so important and can so easily change the whole mood of the room. that corner is just lovely! I have a ton of sites i look at... i love those glamorous and lady like lamps! What a gorgeous lamp....love your little vignette! !